tick on human skin. Ixodes ricinus, the castor bean tick, is a chiefly European species of hard-bodied tick. We're now into the best time of year to enjoy the great outdoors here in Ontario, whether that means cottaging, camping, canoe tripping or just going for a nice walk in the woods. But while you're enjoying those best parts of summer, it's very important to bear in mind the potential risks of Lyme disease -- and to protect yourself. Blacklegged ticks cannot fly, but settle on grass and bushes until they attach themselves to a passing person or animal. The ticks are known to feed on migratory birds and can be carried by them throughout the province. A person can become infected with Lyme disease if they are bitten by an infected tick, but time is of the essence: in most cases, the tick must be attached for at least 24 hours for the Lyme disease bacterium to be passed on to the host. The most common symptom of Lyme disease is an expanding skin rash. The rash can begin at the site of the tick bite between three and 30 days after exposure, and usually grows in size for several days. But many people never get -- or see -- a rash. If you come down with Lyme disease and it is left untreated, other symptoms may develop in the weeks following exposure -- including rash, fever, chills, headache, fatigue, muscle and joint aches, problems with your heartbeat, breathing, balance and short-term memory. In rare cases Lyme disease may result in death. However, timely treatment can help. 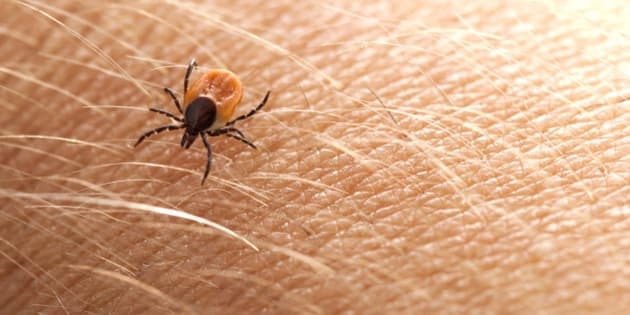 See your doctor as early as possible if you have symptoms or if you feel unwell in the weeks following a tick bite. The earlier treatment is received the better. Lyme disease is not transmitted from person-to-person. However, dogs and cats can carry the ticks into your home and place families at risk of being bitten. Check your pets for ticks daily, and talk with your vet about keeping your pet protected from ticks. If ticks are found on your pet, remember that you are also at risk when spending time in the same outdoor environments. Wear light-coloured clothing. It makes ticks easier to spot. Wear closed footwear and socks, a long sleeved shirt tucked into long pants. Tuck your pants into your socks. Use a tick repellent that has DEET or Icaridin on clothes and exposed skin (be sure to follow the manufacturer's directions). Search your clothes and body for ticks at least once a day, paying special attention to areas such as the groin, navel, armpits, scalp and behind ears and knees. Use a mirror to check the back of your body or have someone else check for you. Don't forget to tick-check children in your care as well. Take a shower as soon as you can after being outdoors to more easily find and wash off any ticks crawling on you. Follow these instructions to safely remove any ticks that have latched on to you. Place outdoor clothing through the dryer cycle for 60 minutes on high heat before washing to kill any ticks that may be hard to see. Ticks thrive in wet environments. In Ontario, locations that have established blacklegged tick populations include areas in Eastern, Southwestern, Central and Northwestern Ontario. Risk areas have spread further across Ontario. Blacklegged ticks feed on and are transported by migratory birds. While the probability is low, it's possible to encounter an infected tick almost anywhere in the province. Learn more about Lyme disease at Ontario.ca/lyme, and talk to your health care professional or local public health unit. Dr. David Williams is Ontario's Chief Medical Officer of Health.